As we're more than 2/3 of the way through the course, I find myself a bit disappointed about the execution of the course. In a course on adult learning that focuses on theory, there has been some positive elements employed such as empowering the students to conduct the class and become much more involved in the learning process. And yet, we largely fell into the default positions of a typical undergraduate class (we're all guilty of this; the learners, the group instructors--I'm not divorcing myself from it--just reflecting on it). Virtually, all of the classes have been this format: Start with a small activity. Move into a lecture format wherein the group tells the class about the different people in the field and how the theory works. This is followed by another activity and maybe some discussion. End of class. This is an adequate format. We've all been exposed to hundred of classrooms in our lives that are conducted in very similar ways. It's safe and relatively acceptable. Therein, there seems to be a great disconnect from what the groups are teaching and what they are doing. Many of the theories argue and encourage different approaches to instruction. They also encourage us to think about communicating the information differently, yet we all seem to default to the behavioral method illustrated earlier in class and in our own educational experience. We ingest facts and do an exercise, but we don't necessarily ingest or experience the theory at work. The exercise is nice, but it isn't enough on its own. The layout identified above seems to say, "here's the information, do what you want with it, but it hasn't been interestingly enough to us to actually try it." 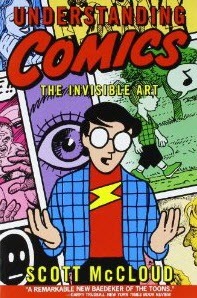 It reminds me of why I'm such a big fan of Scott McCloud's Understanding Comics (check out his great Ted Talk). McCloud's central point is that comics are awesome and that they have so much to offer. It was published in 1992; well before people took comics as serious as some of us do today. But it wasn't McCloud's strong and insightful argument that made the case; other works touting the power of comics had been around for a while. What changed the game was the fact that it was in comics form. As I explain it to others, imagine if you were trying to explain all the nuances and elements of poetry, but didn't do it in a lecture or standard essay, but communicated it through a long and well-composed poem. McCloud created a 220+ page comic book that explained all the intricacies of comics. He used the form to to talk about the form and did so in a way that made sense to all that read it. You get to the end of Understanding Comics and you know that there is no better way to engage in learning about the form. It seems to me that if we are the educators we're aspiring to be; this is what we should be aiming for; a full immersed learning experience based around the theory--not just teaching the theory through a previous model. I totally agree; I think we are falling short of embracing the theories when teaching the theories. Furthermore, our discussions are falling just short of getting to the deep end of each perspective. Let's take that as a challenge for the rest of the class. Btw, what were those Ted talks you mentioned? Can you post them on the wiki? I think challenging the class is interesting, but with only 1 class of presentations left, I have to wonder if that's even feasible.